The following TVs would all make an excellent choice as the centerpiece of your living room. 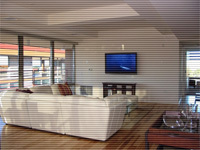 From small to massive these televisions should fit any size room and any budget. For 2011 Samsung ups the ante in TVs again, their UN series LED TVs were immensely popular in 2011 and each one we reviewed was impressive in picture quality, appearance, feature set and overall quality. Replacing last year's C8000 series are the D8000 series and they are slimmer, lighter, better looking and loaded with even more features. It doesn't look like Samsung will be losing the TV crown in 2011. The UN60D7000 uses a 1080p, 240Hz LCD panel with LED edge lighting, the edge lighting is capable of local dimming for increased contrast in dark scenes and better contrast than LED or LCD televisions with constant back lighting. Sharp's new X-gen LED panel with Quattron Quad pixel technology is impressing me more and more. 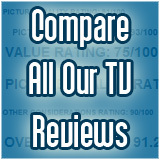 Once you review as many TVs as we do, you get used to the most subtle differences in a TVs picture performance. What I am beginning to realize is that Quattron panels offer something more than your average LED TV. Not only are yellow and gold colors more acutely interesting, all of the colors pop more ??? but not with typical contrast enhancement. Maintaining a natural richness while improving color dynamics is a difficult task, and I am more and more a believer in this technology which I initially thought was a gimmick to be quite honest. The LC-60LE830 enjoys all the benefits of Sharp's best panels while foregoing some of the more expensive features. The LW6500 is another of the new passive Cinema 3D LED back lit LCD televisions. It is a high end TV that includes the full SmartTV internet suite and the motion controlled Magic Wand remote along with the aforementioned Cinema 3D feature. See our video review and full written review of this new LCD television. While the wall is becoming a more and more popular place to put your TV in the living room, many people still prefer a stand, even if that stand is just below the wall mounted TV as a place to hold home theater receivers or your DVD collection. Below are some recommendations we have for TV stands in different ranges of prices and looks.